For the 15th consecutive year, the School of Art + Design at San Diego State University, along with the Athenaeum Music and Arts Library in La Jolla, will present the annual student scholarship program and exhibit, featuring the 2017 recipients of Art Council Ambassador prizes and awards. The student honorees and exhibitors include: Danni Bao, Liz Koerner, Yvette M. Michalak, Cathy Nguyen and Leslie Shershow. 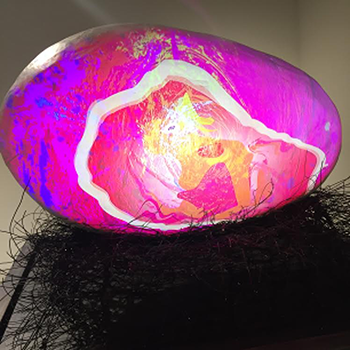 The evening is a double header for SDSU because the Athenaeum is concurrently hosting a reception and exhibit of the 2016 San Diego Art Prize winners, including our very own Associate Professor of Sculpture, Richard Keely. Both exhibitions will run from May 13 through June 10, 2017. SDSU Art + Design student scholarship winners will give short presentations about their evolution as artists, followed by a reception in the Athenaeum’s Rotunda Gallery featuring examples of their work. The show is the highlight of the Athenaeum’s exhibition calendar. All events are free of charge and open to the public.